I love Blow-Up – but can’t for a minute pretend I really understand it. David Hemmings’ is the David Bailey-esque photographer who believes he’s captured a murder when he blows up a photo he’s taken in a London park. But no-one really cares. Perhaps Antonioni is emphasising the shallowness of Swinging London – or perhaps it’s something more (or less) deep. Either way, it’s an enjoyable film – and very much a statement of style (Antonioni even had the grass painted green in the park). 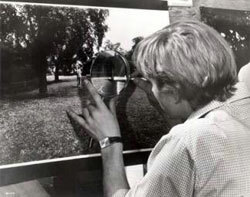 That style is currently being exhibited at the Photographers’ Gallery in London under the title Antonioni’s Blow-Up. Paintings by Ian Stephenson, an artist who utilised a splatter-gun style, were a powerful influence on Antonioni, who featured his work in the film. This exhibition features some of those paintings alongside pictures taken by Don McCullin for Antonioni of Maryon Park – the place where the photographer believes he has captured the murder on film, along with photos taken on set by Arthur Evans. The exhibition is on now and runs until September 17th.